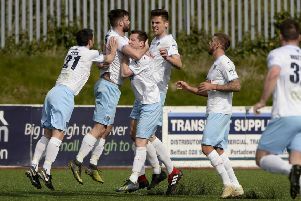 Saturday's Irish Cup semi-final could be one of the most important games of Glenn Ferguson's tenure as Ballymena United manager. Picture: Press Eye. It’s still fairly difficult to imagine that Ballymena United will be taking part in their sixth semi-final under Glenn Ferguson this weekend. At least Ferguson’s tenure has breathed new life into one of the great media myths - that of Ballymena being a ‘cup team’. There has been precious little evidence of that over the past decade or so, at least until the last three years. And yet, this Saturday’s teatime Irish Cup semi-final against Portadown has arguably more resting on it than possibly any of the ones that preceded it. Defeat this weekend might well spell the end of the road for several members of United’s current squad at the end of the season. Ferguson’s comments in Saturday’s post-match interview about needing more quality in the squad were telling, when it comes to his future plans. The excitement of various cup runs - particularly this season - has, to an extent, masked a series of deficiencies that have been cruelly exposed, particularly in the marathon slog of a Danske Bank Premiership campaign. It’s a telling statistic that in 2015, Ballymena have won more cup games than they have in the league. Saturday’s game against Crusaders was entirely the fixture that United did not need. Even at full strength, United would have had their work cut out to contain a Crusaders side which finally looks like fulfilling its undoubted potential. But stripped of a number of key personnel, it was unlikely that the gutsy, whole-hearted display United produced would be enough to take anything from the game. Four points from nine league fixtures since the turn of the year is a miserable return by anybody’s standards and while United haven’t gone spiralling down the table, the gap between them and the clubs below them has narrowed considerably. The Irish Cup run has gone a long way towards lifting the gloom and who’s to say that won’t continue this Saturday. On any given day, United are perfectly capable of beating any opposition - doing that on a consistent basis has been a different story altogether. But if there’s one thing United’s cup run this season has taught us, it’s to expect the unexpected!